The Pacific Life Holiday Bowl San Diego, CA will be played end of December. Often regarded as "America's Most Exciting Bowl Game", this bowl game is a highlight of the college football season and one of San Diego's classic sports event! The 2009 game at Qualcomm Stadium will feature the Nebraska Cornhuskers (representing the University of Nebraska-Lincoln) vs. the Arizona Wildcats (representing the University of Arizona). Since 1997 the Pac-10 runner-up serves as the game's anchor team to oppose the third selection from the Big 12. However, that is not how the Bowl started. Originally, in its first year in 1978 the plan was to have the WAC (Western Athletic Conference) champion play against a nationally-ranked opponent. The WAC champion served as automatic host team in the Bowl from 1978 through 1994. From the game's inception through 1990, the Bowl matched the WAC champion against an at-large team. But there was a change in 1991, when the Bowl reached an agreement to have the Big Ten third selection play the WAC champion. At the end of the original term (1978 - 1994), in 1995, a new agreement was reached between the Bowl, Cotton Bowl, the Pac-10, Big 12 and WAC. From now on the Pac-10 runner-up or the WAC champion would play either in the Holiday or the Cotton Bowl and the Big 12's third selection would play in the this Bowl. The Bowl had several sponsors. The current one, Pacific Life Insurance Company has been the title sponsor now since 2002, preceded by SeaWorld (1986-1990), Thrifty Car Rental (1991-1994), Plymouth (1995-1997), and Culligan (1998-2001). As a side note, One of the more popular (yet unusual) events associated with the Holiday Bowl is the Wiener Nationals, the national championships for the U.S. dachshund racing circuit. 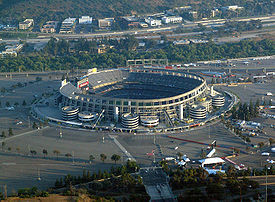 Qualcomm Stadium is also previously known as San Diego Stadium and Jack Murphy Stadium. It is (like many other stadiums these days) a multi-purpose stadium. It is the home of the San Diego Chargers of the National Football League and of the San Diego State University Aztecs college football team. Beside this Bowl it also hosts the San Diego County Credit Union Poinsettia Bowl every December. The stadium can hold over 71,000 spectators (a few less for baseball). It acquired its current name in 1997 when Qualcomm Corporation paid $18 million for the naming rights. The naming rights will belong to until 2017. Buy your Pacific Life Holiday Bowl Tickets now before it is too late and be one of the tens of thousands enthusiastic fans in this great stadium.